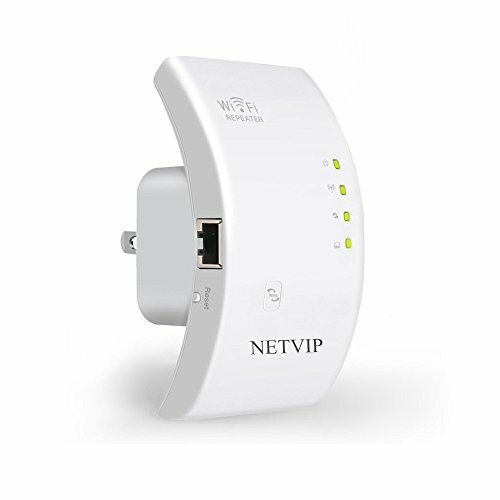 WiFi Range Extender,Netvip Wireless Repeater 300Mbps WiFi Signal Amplifier Booster Supports Repeater/Standard Ap Mode Plug and Play 360 Degree Full Coverage Router No Dead Zone with WPS Button | Replicafer Co. This WiFi extender will boost the range of your existing WiFi and create a stronger signal in hard-to-reach areas. Is there a void between your WiFi router and your devices? Add a WiFi Extender and strengthen your connection. How to set up repeater mode? 1. Plug the Wi-Fi Repeater into an electrical outlet near your router,and wait until the WLAN LED is lit. 3. Open your browser and enter the IP address "192.168.10.1" on the URL bar. 4. Type in the username and passwords both "admin" to log into the next webpage. 5. Choose and click "Repeater" under the wizard. 6. Select your existing WiFi(which you want to extend) and click "Apply" to continue. 7. Change(or not) the Repeater SSID (default is WiFi Repeater); Type in your home WiFi passwords.-- Please note the passwords here must be SAME as your home WiFi passwords. 8. Wait a few seconds,Search the wireless SSID you set in the list,and connect to this SSID. If you have any questions about its function or configuration,please feel free to contact with our service team. - usnetvip@outlook.com.Thank you! ☀ INCREASING SPEED AND RANGE : Reliable 2.4GHz wireless network speed up to 300Mbps and 360 degree wifi coverage,let you bid farewell to low speed internet. ☀ 2 IN 1 FUNCTION : Repeater mode，AP mode.Compatible with any wireless network,router and WiFi enabled devices including smartphone,iPhone,iPad,laptop,smart TV,ect. ☀ EASY SET-UP : Convenient for the wall-plug design,wall plug design making it easy to install,move,and play.Ideal for home/travel/office usage. ☀ WPS FUNCTION : Our repeater supports one-touch wireless security encryption with its WiFi protected setup button,let you get access into internet safely. ☀ RESET BUTTON : Press the reset button for 10 to 15 seconds when you fail to connect your devices with this repeater or when you forget the password. If you have any questions about this product by NETVIP, contact us by completing and submitting the form below. If you are looking for a specif part number, please include it with your message.